Earn up to 4,096 reward points. Elegant 3/4 size 6-string guitar that' easy to play and easy on the eyes. Blueridge has designed a beautiful little guitar in answer to numerous requests for a small, 3/4 size 6-string guitar thats easy to play for youngsters or anyone with smaller hands. Its the new BR-41. It features a stunning solid spruce top with handcarved bracing and mahogany back and sides for excellent tone and projection. A low-profile, mahogany neck with 22-7/8" scale makes playing easy on the fingers. Eye candy includes ornate inlays, tortoise body binding, vintage style tuners, and more. 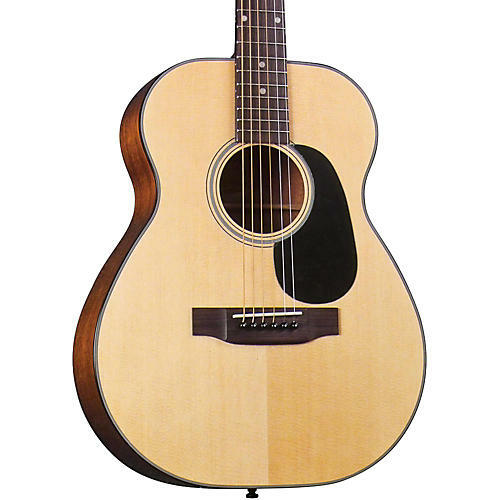 The Blueridge BR-41 also makes for the perfect travel guitar as well as a convenient tool for songwriters. Check out all that the BR-41 has to offer and see how this would be a worthy addition to your collection. Elegance and great sound do come in small packages. Order today.